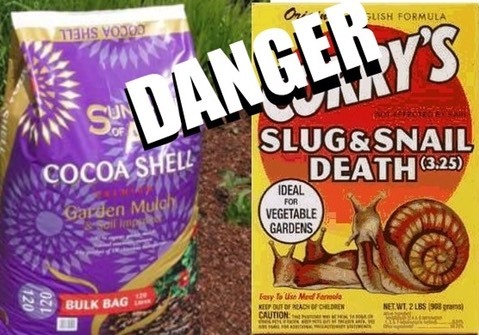 Please be aware of the dangers of snail bait and cocoa mulch in your garden AND the gardens of anyone that you may be visiting. The symptoms of snail bait poisoning include twitching, drooling and muscle tremors. Dogs can also vomit, seize, pant and have a fever…you must get to the vet immediately. Take the packet containing the snail bait with you and if your dog has vomited then take that with you too (for testing). There is no antidote for metaldehyde poisoning. Your vet will give supportive treatment by treating the symptoms. Saucers filled with beer and hand plucking snails is the safest method. If you must use a snail bait then speak with the staff at your garden centre and ask their advice on pet safe products. Read the labels, check with the manufacturers. While most mulch will cause nothing more than stomach upset if our pets eat it, cocoa mulch can be more toxic! Cocoa bean shell mulch could potentially be more serious - with pets developing signs similar to that of chocolate poisoning, including vomiting and diarrhea. In cases where very large amounts of mulch have been consumed, muscle tremors or other more serious neurological signs could occur.